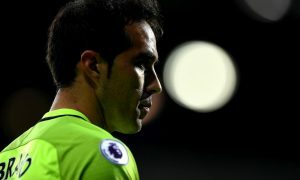 Manchester City’s Carabao Cup hero, Claudio Bravo, is not short of interest from prominent European clubs despite being demoted to a supporting role since the acquisition of Ederson last summer. Bravo has appeared only once in the Premier League this season, when Ederson was injured in the 5-0 win over Liverpool, but has made 10 appearances in cup competitions. Is it enough for the 34-year-old Chile stopper? His future is uncertain, but according to La Cuarta in his homeland, Ligue 1 giants Paris Saint-Germain and Serie A side Napoli both have an interest in him. The Chilean source reveals that this news comes from someone close to the player, who is quoted as saying, “If Bravo leaves England, he would go to a club as important as City with the ability to win titles. The Parisiens are thought to be in the hunt for a new goalkeeper, with Kevin Trapp not quite convincing. Meanwhile, Napoli are poised to lose Pepe Reina on a free transfer to AC Milan at the end of the season. La Cuarta claims that last summer, Manchester City and Napoli were a step away from trading Bravo and Reina, before the Chilean decided to stay in England. A year on, and he may now find the prospect of being Napoli’s first-choice goalkeeper appealing after falling down Pep Guardiola’s pecking order.